Unless you’ve been living in another galaxy, by now you’ve heard the news — Star Wars: Galaxy’s Edge is opening on May 31 in Disneyland and August 29 in Walt Disney World! Jedis and Paadawans around the globe are plotting their visit to Star Wars Galaxy’s Edge. However, if Batuu is not your family’s final destination, you may consider an out-of-this-world vacation on a Disney Cruise…to Alaska. Visiting Alaska is almost like visiting another planet. Alaska offers un-matched natural beauty and is nothing less than a spiritual awakening. Photos of Alaska can’t compare to actually standing on the deck of the Disney Wonder as it sails through pristine waters dotted with blue translucent icebergs. Breathe in the crystal-clear air and feel it touch your face as you pass snow-capped mountains, ancient glaciers, untouched forests and towering waterfalls. You wonder if, somehow, you were magically transported to a new world. 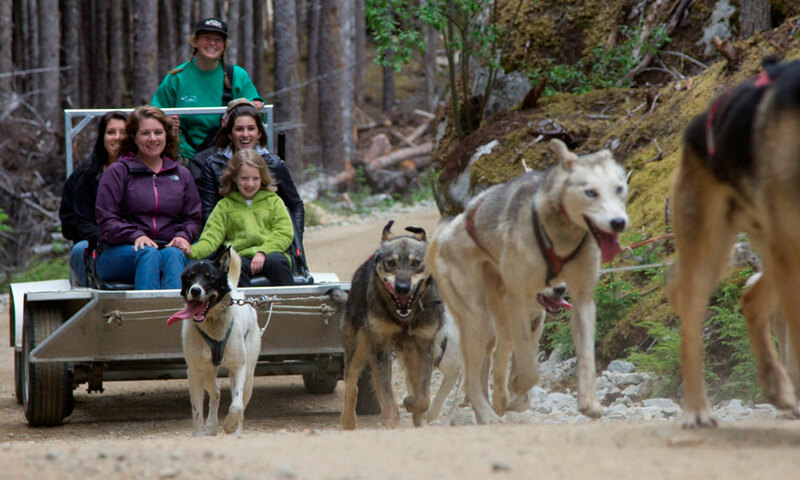 Ideal for multi-generational families traveling together, Alaska has something for everyone. 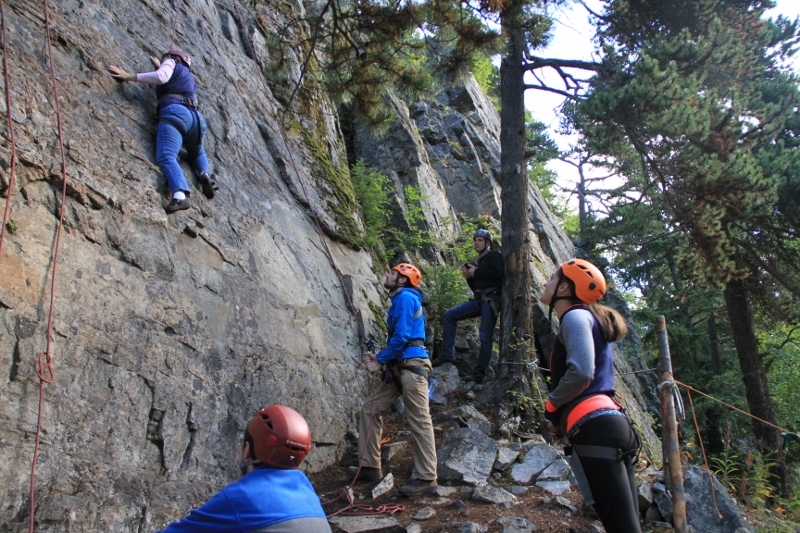 For the thrill-seekers, you can get physical on port adventures such as zip lining, dog-sledding and rock climbing. If you prefer to stroll the quaint shops, observe nature, or learn more about the landscape and culture, you won’t have to walk more than a few steps off the ship. In-stateroom gift details: Be treated to a little extra fun during your cruise! Overflowing with Disney Cruise Line-branded gifts for the entire family, this delightful package includes a tote bag with a cooler at the bottom, a 3-in-1 game set (chess, checkers and backgammon) with an accompanying travel pouch, a 3-person gift hanger and 2 luggage straps. Please note: The gift hanger doesn’t include items or gifts. Family Nautical Package valued at $59 plus tax. New bookings only. Previously booked Alaskan Disney Cruises do not qualify. Offer expires on April 26, 2019.Offer is void and has no cash value if reservation is cancelled or modified to 2020 or a different itinerary. This offer can be combined with Small World Vacations’ $50 – $1000 Onboard Credit offer. Board a bus with a guide in authentic 1880’s dress for a historical tour of Juneau. 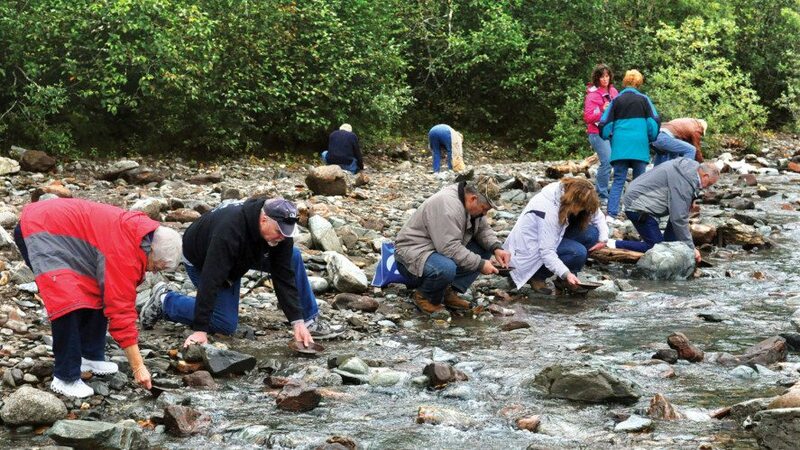 In a secluded setting near a waterfall alongside Gold Creek (only accessible under this tour’s special permit) the guide will show you how gold panning is done. After you collect your treasure, a short ride transports you to the Gold Creek Salmon Bake. 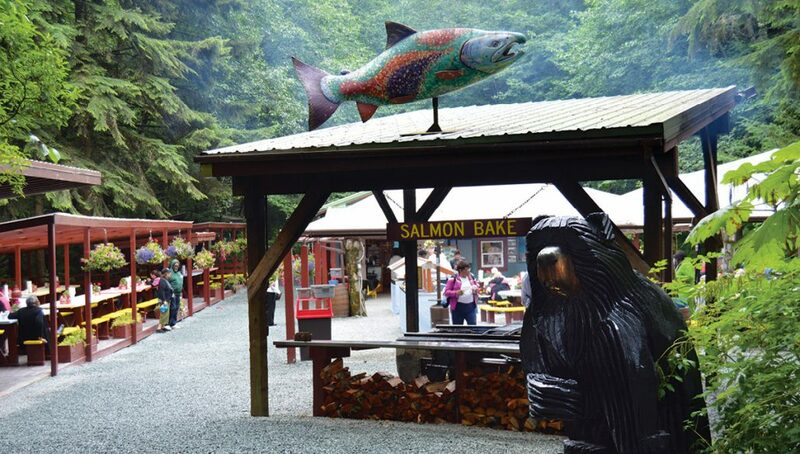 The bake is set in a lush rainforest alongside a creek, where you’ll feast on wild salmon grilled slowly over fragrant alder wood. During this 3.5-hour wilderness hike for the entire family, you’ll take in magical waterfalls and serene meadows that can only be discovered on foot. Observe past glacial events left by the natural forces that created this scenic wilderness. A guide brings the legends of each totem pole to life during your visit. You’ll enjoy free time in the gift shop or explore the Totem Park at your leisure. All ages. Just steps from the dock, get ready to hoot and holler! An action-packed performance that you cannot miss. 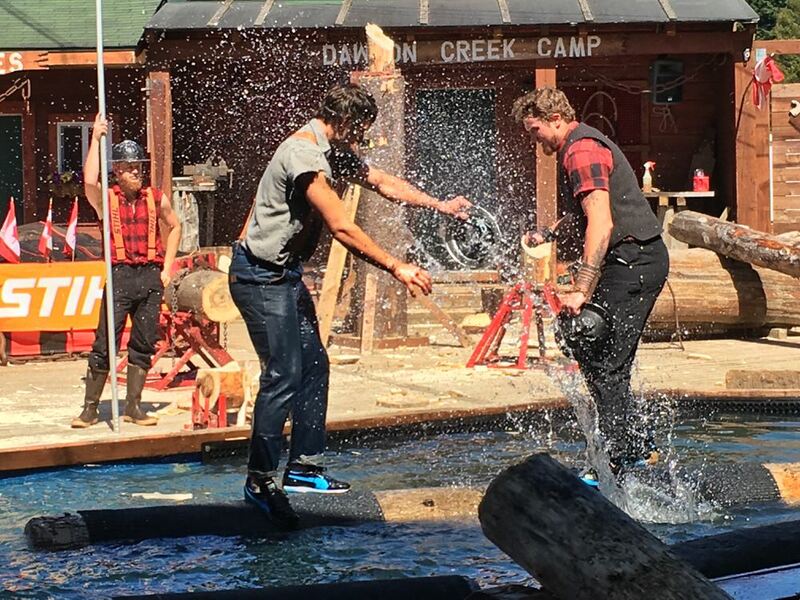 There’s chopping, sawing, chainsaw events, the death-defying speed climb, log rolling and more. An experience that is great for the entire family and is full of action, excitement, comedy and more. All ages. 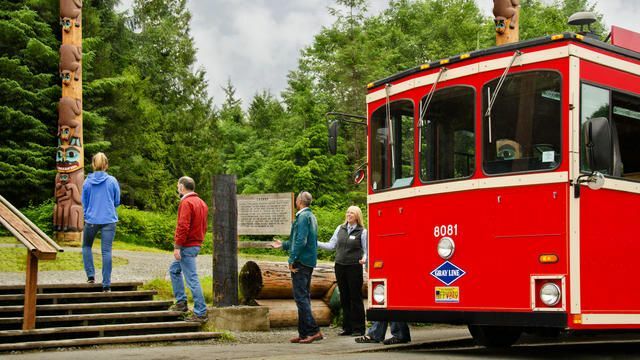 Board a narrated bus ride and enjoy panoramic views of Hoonah, Port Federick and Icy Straight as you make your way to the top of the mountain — higher than the Empire State Building! 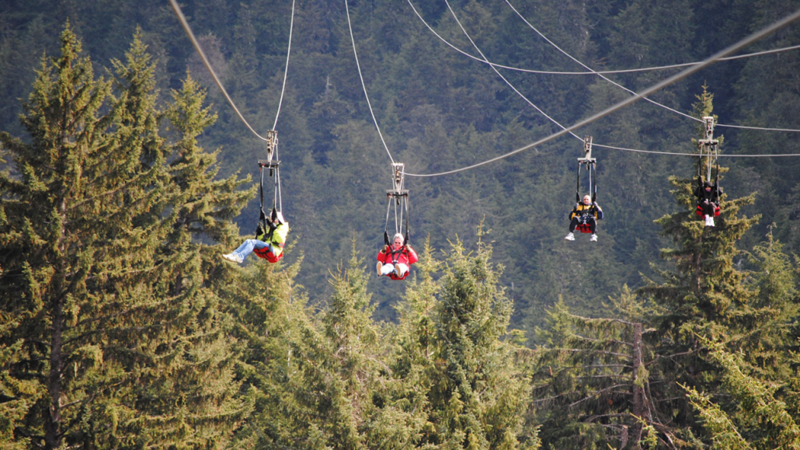 A truly unique adventure, ZipRider can accommodate 6 riders at the same time. Ages 7+, weight restrictions apply. Work together as a family! 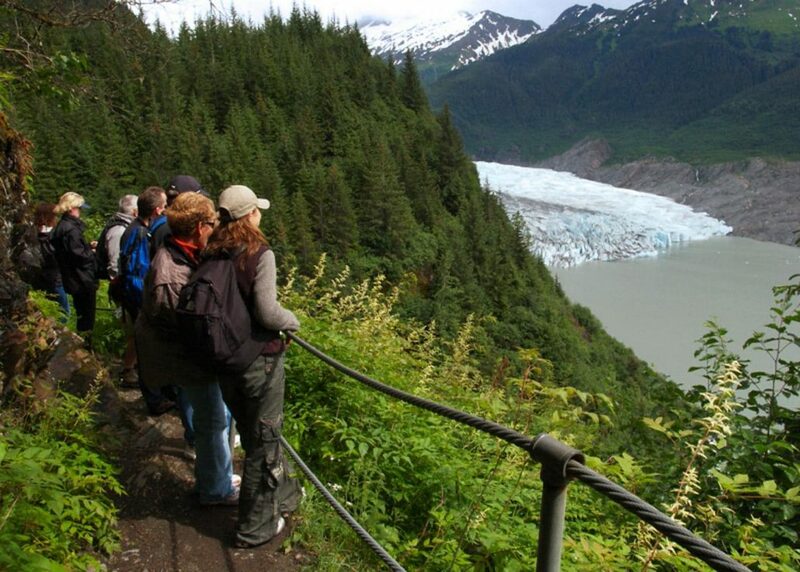 Explore Icy Strait Point in search of Alaskan treasure, with a special surprise at the end. All ages. 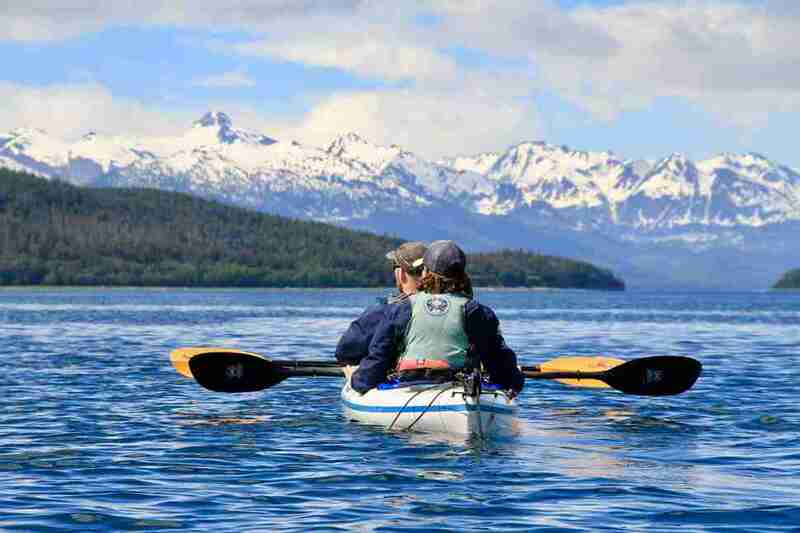 Kayak in the pristine waters, surrounded by the beautiful Alaskan wilderness. Keep your eyes out for wildlife including sea lions, humpback whales, Sitka black tail deer, brown bears and eagles. Ages 14 +, weight restrictions apply. In each of the three ports, you’ll have the opportunity to get a closer view and immerse yourself in the sheer size and beauty of the glaciers as you weave through the rugged shoreline. Explore the natural wildlife, and keep an eye out for pigeon guillemots, bald eagles, harbor seals, mountain goats and bears. If you’re lucky, you might get to feel the “white thunder” when immense chunks of ice break from the glacier and crash into the sea. All ages. All port adventures are subject to availability. Certain age and weight restrictions may apply. 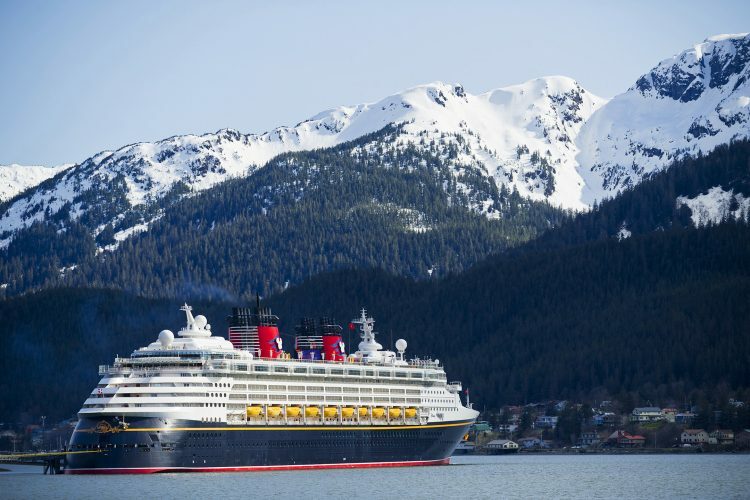 Small World Vacations’ Exclusive Offer on Disney Cruises to Alaska May 27 – September 2, 2019. One Free Family Nautical Package per 2019 Alaska Disney Cruise Booked with Small World Vacations between April 8 and April 26, 2019. Sail dates include May 27 – September 2, 2019. Be treated to a little extra fun during your cruise! Overflowing with Disney Cruise Line-branded gifts for the entire family, this delightful package includes a tote bag with a cooler at the bottom, a 3-in-1 game set (chess, checkers and backgammon) with an accompanying travel pouch, a 3-person gift hanger and 2 luggage straps. Please note: The gift hanger doesn’t include items or gifts. Family Nautical Package valued at $59 plus tax. New bookings only. 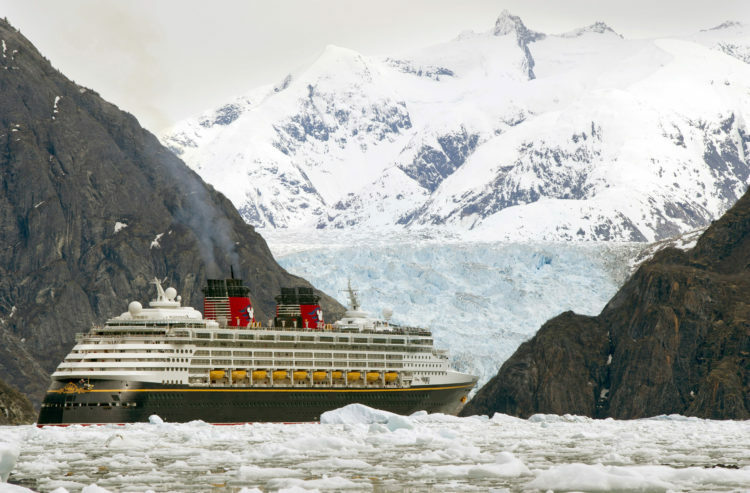 Previously booked Alaskan Disney Cruises do not qualify. Offer expires on April 26, 2019. Offer void and has no cash value if reservation is cancelled or modified to 2010 or a different itinerary. This offer can be combined with Small World Vacations’ $50 – $1000 Onboard Credit offer. .
Small World Vacations offers onboard credit of $50 – $1000 based on the cost of your cruise fare only. Onboard credit courtesy of Small World Vacations. Transferred cruises or those booked while onboard a Disney Ship are entitled to a reduced onboard credit. Click here for details and restrictions.